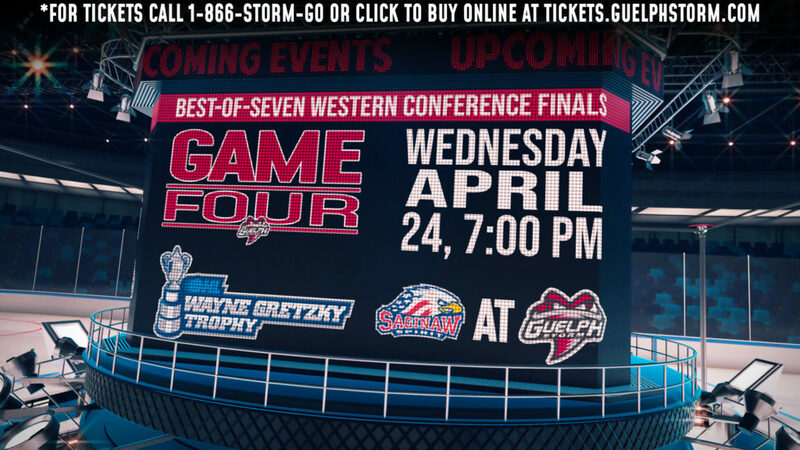 Guelph Storm coach George Burnett wasn’t biting. 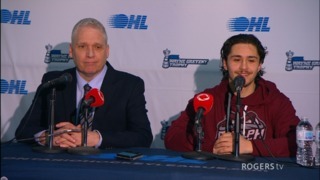 His team rode an emotional roller coaster to a 7-5 win over the Kitchener Rangers Tuesday night to get back in their playoff series when he was asked if a couple of bad penalties by the Rangers turned the tide of the game in the Storm’s favour. 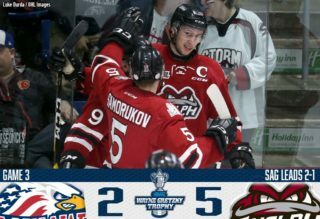 Ex-Storm forward Givani Smith was in the penalty box for the tying goal after bowling over the Storm’s Cam Hillis on a line change. He was also in the box when Nate Schnarr scored a power play goal in the second period, this time for retaliating to an Isaac Ratcliffe cross check that went uncalled. 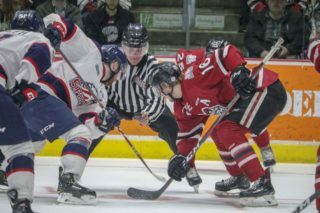 Guelph seemed to channel the emotion of Tuesday’s game in a more positive manner than the Rangers, who still lead the best-of-seven series 2-1, with Game 4 set for Wednesday night at the Sleeman Centre. A disappointing crowd of just 2,832 took in the game. “Lots of people down on us right now and we find a way to win tonight. I think it’s incredibly important that we’re much better tomorrow,” Burnett said. 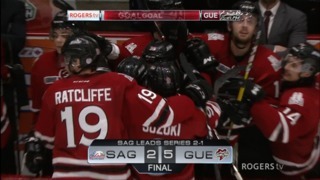 Guelph tied the game on a power play goal by Alexey Toropchenko with 2:09 in regulation then got the game winner 24 seconds later when Zach Poirier tipped a Mark Shoemaker point shot past Mario Culina in the Rangers net.